We’d love your help. 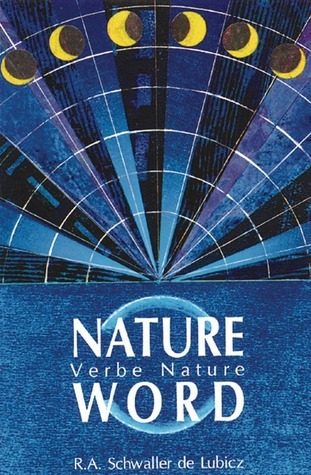 Let us know what’s wrong with this preview of Nature Word by R.A. Schwaller de Lubicz. To ask other readers questions about Nature Word, please sign up. A deep hermetic exploration of the intelligence of the heart, a way of understanding as nature could in its harmonious relationships: "Nature had shown me a great mountain, crowned with a peak of immaculate whiteness, but She was unable to teach me the way leading to it. I had to seek beyond Her. It was a long search..."
Thinking as process. Alchemy. Evolution of consciousness. Suggests that consciousness is evolving. Known to English readers primarily for his work in uncovering the spiritual and cosmological insights of ancient Egypt. In books like Esotericism and Symbol, The Temple in Man, Symbol and the Symbolic, The Egyptian Miracle, and the monumental The Temple of Man--whose long awaited English translation has finally appeared--Schwaller de Lubicz argued, among other things, that Egyptian civilization is Known to English readers primarily for his work in uncovering the spiritual and cosmological insights of ancient Egypt. In books like Esotericism and Symbol, The Temple in Man, Symbol and the Symbolic, The Egyptian Miracle, and the monumental The Temple of Man--whose long awaited English translation has finally appeared--Schwaller de Lubicz argued, among other things, that Egyptian civilization is much older than orthodox Egyptologists suggest, a claim receiving renewed interest through the recent work of Graham Hancock and Robert Bauval. If his view of Egyptian antiquity wasn't enough to place him securely beyond the pale, he also argued that the core of ancient Egyptian culture was a fundamental insight into "the laws of creation." Everything about Egyptian civilization, from the construction of the pyramids to the shape of a beer mug, de Lubicz claimed to be motivated by a central metaphysical vision about the nature of cosmic harmony and an awareness of humanity's place in the evolution of consciousness. As his translator Deborah Lawlor remarks (introduction to Nature Word 47), Schwaller de Lubicz's Egyptian studies are only a part of his overall work as a metaphysician and philosopher. Born in Alsace-Lorraine, then part of Germany, René Schwaller grew up in a polyglot atmosphere. (He was later given the title "de Lubicz" by the Lithuanian poet and diplomat O. V. de Lubicz Milosz, for his efforts on behalf of Lithuania in the aftermath of World War I.) Alsace-Lorraine has oscillated between French and German rule many times since Schwaller's birth, and this Franco-Germanic blend lends a curious characteristic to his work. As Christopher Bamford (introduction to Schwaller’s Study of Numbers 1) suggests, Schwaller thought in German, but wrote in French. Added to the inherent difficulties of expressing nonlinear, "living" insights in "dead" linear language, this odd combination places many obstacles before a first-time reader. As he wrote apropos the insights into "functional consciousness," presented in his truly hermetic work, Nature Word (129): "Nature had shown me a great mountain, crowned with a peak of immaculate whiteness, but she was unable to teach me the way leading to it." Readers wishing to grasp Schwaller's insights may feel that they, too, have found themselves at the foot of a very steep mountain. This challenging prospect would not have fazed Schwaller. He believed knowledge was the right only of those willing to make the effort to achieve it, the elite who would endure suffering in their pursuit of wisdom. This sensibility influenced his political views as well.